These designs are sketches of one of the variations of creatures I might use in an upcoming project. Much more to come! More creatures involving this theme and maybe a finished version of this one. 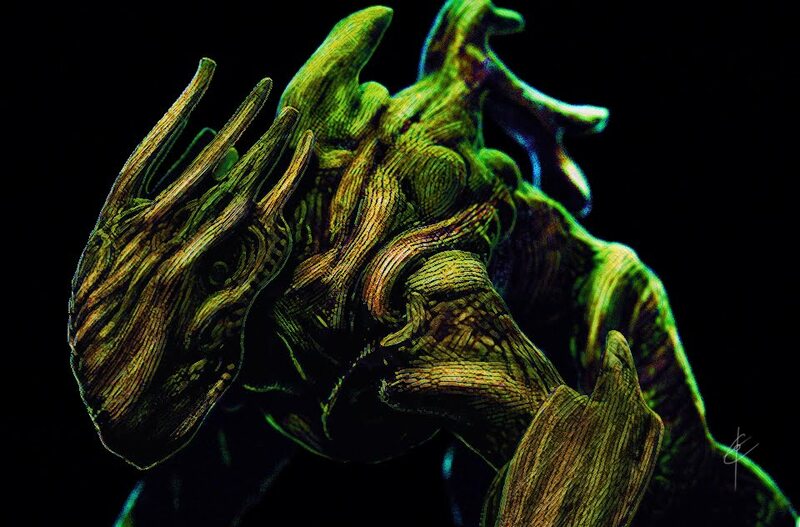 I got quite excited about the new Zbrush 4R2 release and decided to doodle something with the new dynamesh feature. This little dude was inspired by a guildwars concept that I stumbled upon on conceptart.org a while ago. Wasn't going for accuracy, rather just dipping my toes in the newer more interesting menus of ZB4R2. The sculpt was rendered out on different materials and comped in Photoshop rather quickly so I apologize for the lack of color variation. After careful consideration I chose to use my Silhouette #8 from my refined sheets. 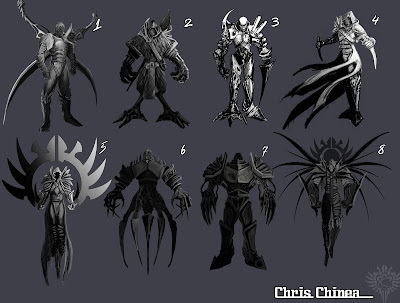 To me it felt as though it had one of the more interesting silhouette designs as well as a more godlike feel to it. Burned some midnight fuel to incorporate some of my more liked drawings and ideas from my previous sketches. This will symbolize the coming of an end to my drawing phase, I might sketch ideas out here and there to include or alter but it's high time I got into Z space. The feet are Johnny the Homicidal maniac inspired, a tribute to one of my more favored characters. Enjoy! Here are the long awaited sketches from the narrowed down silhouettes , some I spent more time on than others. I'm purely focused on bringing this sucker into 3D so I want to finish his concept rather soon. Enjoy! 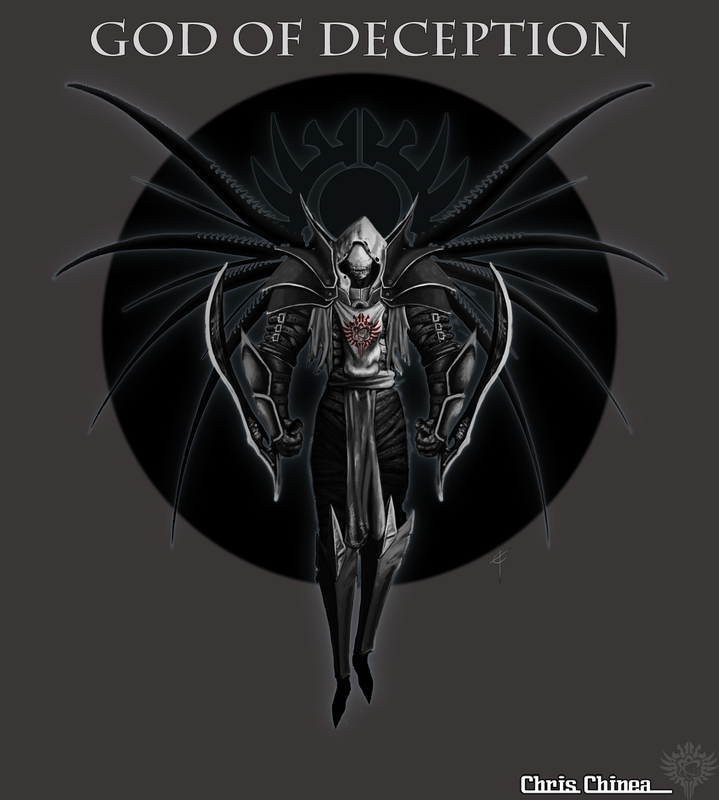 As you can see via my title I have changed the god type from Duplicity to Deception, just so he can govern a wider range of things :). I apologize for these taking so long to put out. 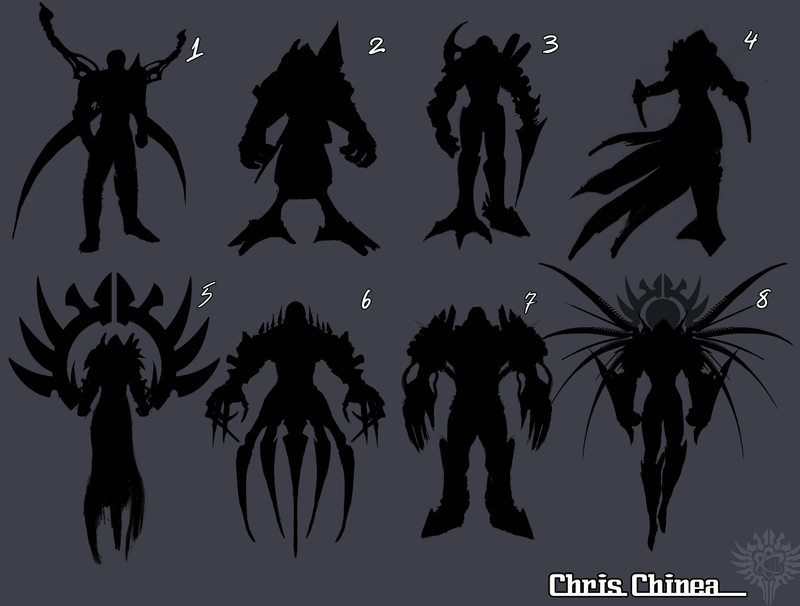 After much help from some concepting tutorials I watched I refined the silhouettes of the character down to 8 that I liked, most of these were cleaned up from my first round of silhouettes. I have actually been working on rendering these in gray scale for a bit and will be done with that before the day is out as well. Look forward to checking it out, just wanted to show you guys all my steps thus far. I'm not dead, I'm currently working on my 2nd phase of silhouettes... Taking the previous silhouettes and defining secondary and tertiary forms. Here's a little taste! After long consideration of either doing a 4 or 2 legged god I decided to go more 2 legged, seeing as my last major project was 4 legged. Anyway! Here is my first line of quick silhouettes that I scribbled. I forgot to post these when I was finished with them lol, I've been working on refining shapes into a new silhouette sheet and defining some secondary forms. Meanwhile, feel free to leave comments about these if you so wish. If you're interested in how I created these, I used a program called Alchemy. It was kinda neat! First time user. Rumored amung men and gods alike, this god's existence has been questionable... Until recently when I found him scouring the wreckage of past battles carving the faces off of deceased generals and salvaging mechanical parts he found nonetheless... interesting. 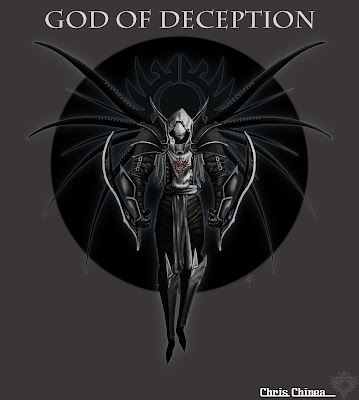 Only tales speak of this faceless deity sitting in his workshop crafting faces to wear, dawning mechanical suits to disguise his flesh, deceiving the innocent and the great to wage war. He endlessly mutilates his own body to disguise himself in perfection. Some say that soon after the last breath of a soldier on a tragic battlefield you can hear him laughing and the gentle clanking of armor as he sifts through the remains to collect his spoils. How can I, being the person who spotted him, be so sure to what I saw? For you, I will attempt to recreate the horrid image of that... that thing! I fear I might be his next chosen victim. Has he been the cause of so many past wars? I do not know what other power he posses or if what I saw was indeed his true form. "All I can remember is.. staring into emptiness as he faced me... tilting his head, as if I amused him...."